Fireflies in a jar table lamp. Frosted glass & stainless steel clasp offer a waterproof seal for indoor & outdoor use. 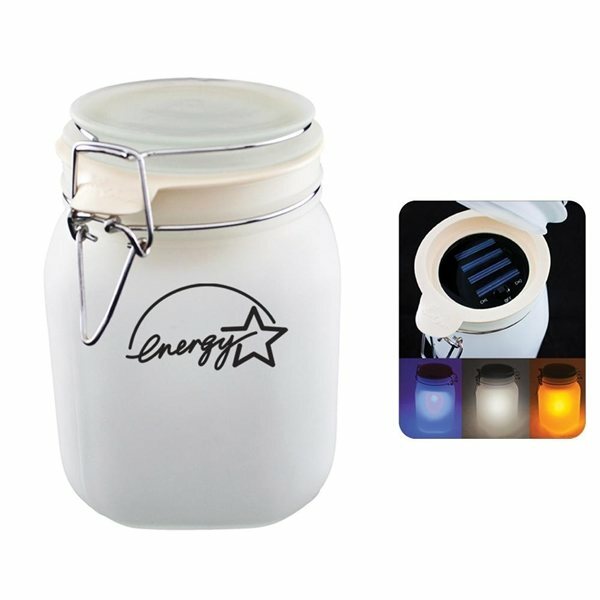 Charge under sunlight or next to a window with the lid open or closed. 8 hours of charge time provides up to 40 hours of light. Other color combinations available upon request. Very nice and unique item. Arrived very quickly. The colors are vibrant and also the printing looked great. High Quality. I like the size and also the multi-functions. the product was exactly what was displayed on the website and will serve our purposes perfectly. I had a great experience with AnyPromo. Everything was done as I had requested and the items looked very pleasant. I cannot say enough good things about AnyPromo. I will buy from them again, no doubt.